Jarome Iginla scored five points in a 6-8 loss to Tampa Bay. Before the game, Iginla trailed Theoren Fleury by one point with 829 points. In the first period, the Captain scores his 399th goal to tie Fleury. 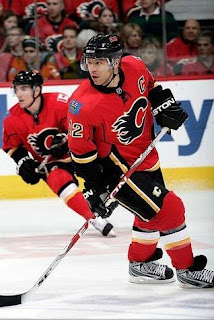 In the second, Iginla added two assists to pass Theoren Fleury as the Flames' All-Time Leading Scorer. 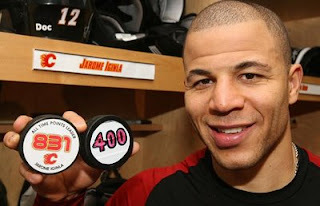 At the opening seconds of the third, Iginla scored his 400th career goal. He also added another assist with a total of 2 goals, 3 assist for a 5 point night. Fleury assisted on Iginla's first goal in a playoff game. Iginla's first NHL point was an assist on Fleury's goal. Congratulations to Jarome Arthur-Leigh Adekunle Tig Junior Elvis Iginla!